Remember that time I reviewed that Only Organic food with quinoa in it, and it got over two times as many page views than anything else I've written? 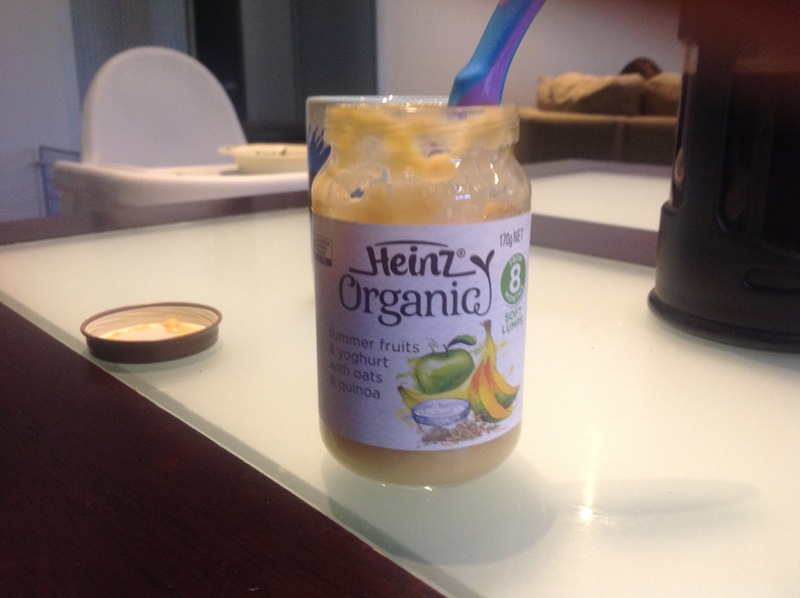 Surely it was a one off and no other company would be stupid enough to put the almighty supergrain in a baby food? Really. Quinoa in baby food. Next thing they'll have toddler sized Lululemon yoga pants. Contains: Fruit (banana (31%), mango (16%), apples (5%)), Apple juice, Cooked oats (contains traces of wheat) (7%), Water, Greek style yoghurt (Cultured milk) (6%), Cornflour, Quinoa (1.7%), Cream, Vitamin C.
Two things stand out to me here. First, the very small elephant in the room is the quinoa, and to be fair, there's a whole 0.1% more in this food than in the Only Organic's quinoa based food, so I suppose there is hope of extra grainy flavour. Possibly with the promise of soft lumps within, there could even be some texture... Can you make quinoa into a soft lump? Secondly, summer fruits: there are only three fruits listed in the ingredients for this food. You want summer fruits? You need peaches, strawberries, nectarines. Apple is predominantly harvested in the autumn months. Bananas, not grown in New Zealand, but are available plentifully year round at a reasonable price. Frankly, in my opinion really only mango can be classified as a truly summer fruit. Emily's reaction: Generally, was quite favourable initially. However, soon food fatigue set in after half a jar. Emily is entering the stage where she wants to feed herself, and she wasn't about to be left wielding a spoon full of imitation cold sick. First impressions: Have I used a cold sick analogy yet? In the last sentence, and several times previously in this blog? I'm using it again. It's yellow, and full of little lumps. It looks like cold sick. But to be fair, it's cold sick that smells predominantly like banana, like someone ate a banana, and then thought better of it. Taste test: Actually against all odds, this goes down a treat. The taste is strongly of banana, with a hint of mango, but very little of the least summery of the fruity trio, the apply. Relatively thick on the tongue, little soft nuggets of rolled oats add an interest as it slides back. And YES! Sure enough, about once every spoonful, your tongue will find a single grain of quinoa! Sure, it's not actually enough to add any flavour, but it's there. That said, a similar texture could be achieved in this food by adding half a teaspoon of poppy seeds, or sand. Overall: 7/10, not a bad taste or texture. Still can't get over the pointlessness of the quinoa though. Enjoy: Down at the Hokowhitu Mums' organic paleo vegan coffee group, or wherever such people meet.